Are you wondering where you can sell your furniture? When it comes to selling furniture, there are many routes that can be taken. Many people, though, choose to sell their furniture directly. However, selling your furniture to a consignment store can be just as beneficial — if not more — than selling the items directly. Consigning your furniture is a great way to make some extra cash in your pocket. It can make moving or redecorating your place far less stressful. If you are looking to sell some of your furniture items, in this blog, we are going to highlight some reasons why you should consider furniture consignment. When you choose to sell your furniture directly, such as through an online classified list or marketplace, it can end up being a stressful time. Not only do you have to message back and forth to iron out details, but there are other hassles that you may potentially have to deal with. However, when selling to a consignment furniture store, all the hassles of direct selling are avoided! The consignment store handles the entire resale process to ensure you are getting the best value for your furniture pieces. Many consignment furniture stores can pick up the furniture pieces you are wanting sell. This makes it very beneficial for large or heavy items, such as an armoire dresser, a large kitchen table, or bedroom furniture. This helps you avoid spending your nights and weekends waiting for potential buyers to come look at your furniture. Instead of putting your furniture out at the next garage sale, if you own gently-used furniture, consigning will help you reach a wider audience. Many people in search of furniture for their homes will start at local consignment shops because they know that they can get quality pieces of furniture at an affordable price! Plus, consignment stores offer much better items than you would typically find on online classifieds. There’s no reason to suffer through the hassle of trying to arrange a garage sale. Many people looking for good furniture usually scour consignment shops because they know that the best pieces end up in the local consignment shops. Consignment stores offer furniture in better condition than items that would typically be found on Craigslist or from garage sales. When people shop for items online or through garage sales, they typically are looking for “steals”, meaning they are looking to take home quality furniture pieces for as little of their money as possible. When people go to furniture stores, however, they expect to pay a fair value with less room to negotiate. Not only does consigning get your items in front of more eyes, but by the eyes of serious buyers who will pay a fair price, which means more money in your wallet! Looking For Furniture Consignment in Pinellas County? 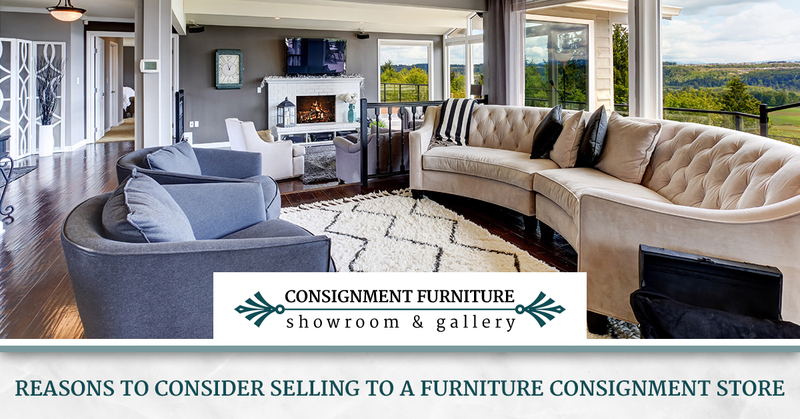 If you have any gently-used furniture you want to sell, be sure to check out Consignment Furniture Showroom and Gallery! With furniture stores in Clearwater and St. Petersburg, we make it easy to sell your furniture for a great price! Contact us today to learn more about our consignment process!